This “northern” is fueled by sexual tension and fights, most of them of the rollicking variety complete with lots of mud and cartoon-like twittering noises when somebody gets punched. That is, it has an overlay of comedy. The story owes a lot to earlier movies about claim-jumping in Alaska, such as The Far Country and The Spoilers. 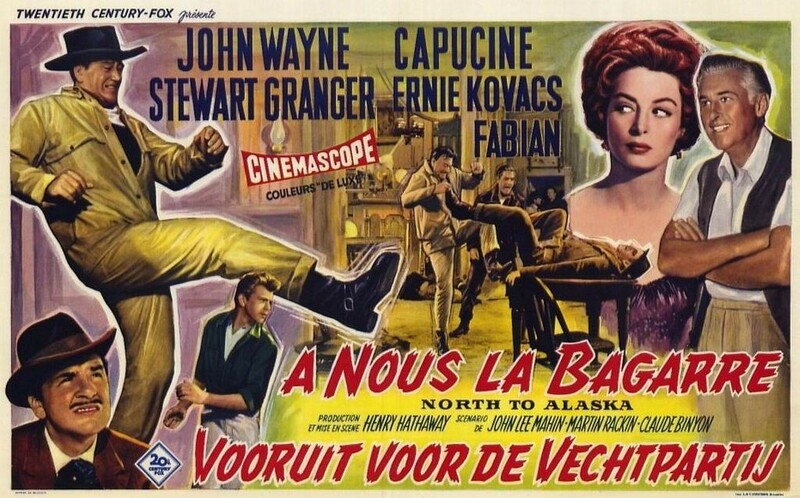 The plot has former Washington logger and now Alaska miner Sam McCord (John Wayne) heading south from Nome to buy heavy mining equipment and bring back for his partner George Pratt (Stewart Granger) the supposed Pratt “fiancée” Jenny, whom George hasn’t seen in three years. Their mining claim is now producing gold richly enough to afford both. In Seattle, McCord finds that Jenny is working as a domestic and is now married to a butler; but in a house of ill repute he also finds the elegant Michelle Bonet (Capucine) and decides to bring her back for George. Michelle, also known as Angel (the backstory for the French actress in this film is that she’s from New Orleans, thus accounting for the accent), is more interested in McCord himself, who, although loudly anti-marriage, generally treats her like a lady. 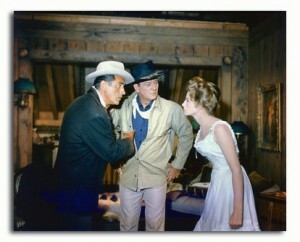 Partners Sam McCord (John Wayne) and George Pratt (Stewart Granger). Meanwhile, sleazy gambler Frankie Cannon (Ernie Kovacs in a rare but very effective movie role) has gained control of the town’s largest saloon/hotel and has started an underhanded operation to take over other people’s claims, including the McCord-Pratt claim. Cannon and Michelle also have a past relationship, which Cannon would like to resume. On McCord’s return to Nome, the differing aims of McCord and Bonet eventually surface, while McCord and Pratt defend their claim against Cannon and fight between themselves. Pratt’s younger brother Billy (played a bit broadly by the singer Fabian) is more a distraction than necessary to the plot. One is tempted to attribute his presence in this movie to that of another teen idol, Ricky Nelson, in Rio Bravo a year earlier. Neither conflict (McCord-Bonet and McCord/Pratt-Cannon) is all that serious, and the ending is fairly predictable. The sub-conflicts (McCord-Pratt over Bonet and Bonet with her own past) also work themselves out well enough. You can tell this movie was made in the early 1960s because the alleged prostitute Michelle never actually sleeps with McCord and thereby regains her long-lost status as a “good girl.” It’s hard to imagine a current filmmaker playing the relationship that way. Ernie Kovacs as sleazy gambler/claim jumper Freddie Cannon. The movie, while not in the very top level of John Wayne westerns, takes its time developing the plot and is pleasantly watchable. The commercial success of the movie was apparently attributed to the exuberant fight scenes. This led to the making of the similar McLintock! a few years later, which had no discernable plot but good muddy fight scenes and a feisty romantic relationship. The theme song here, as performed by Johnny Horton, was a popular hit in its time and might be second only to Tex Ritter’s High Noon theme among sung musical themes for westerns. The experienced and versatile director Henry Hathaway had his roots in silent movies and was capable in a variety of genres, including westerns (Rawhide, Garden of Evil, How the West Was Won, True Grit). He made 31 westerns in his lengthy career. Pratt, McCord and Michelle argue things out. Incidentally, one of the ways Hathaway held down the budget in this movie was to shoot most of it around Point Mugu in southern California, rather than on location in Alaska. This film is part of a modest tradition of good westerns that were set in the Alaska gold rush days of the end of the 19th century. They include The Spoilers, a much-remade film in the first half of 20th century, the 1942 version of which has a legendary fight scene featuring bad guy Randolph Scott and good guy John Wayne; The Far Country (Anthony Mann-James Stewart); and White Fang, based on the Jack London novel (featuring Klaus Maria Brandauer and a young Ethan Hawke). Soapy Smith was an actual con man who, under a cover of respectability, for a time took control of the corrupt civic government and police in Skagway, Alaska, during the gold rush. Several of these northerns feature a version of the real-life Smith character (Kovacs here, John McIntire in The Far Country, Randolph Scott in The Spoilers) and strong, sympathetic female saloon owners (Marlene Dietrich and Anne Baxter in different versions of The Spoilers and Ruth Roman in The Far Country). This entry was posted in 55 Greatest Westerns and tagged Henry Hathaway, John Wayne, Northern Westerns, Western Comedies on September 10, 2013 by Nicholas Chennault.